It’s not every day a best-selling travel writer shows up on your front porch, but that’s what happened early this afternoon in Meaford. Heading out to take out the recycling and compost, we met – or rather, startled by opening the door before he could knock – a Newfoundlander (transplanted originally from Yorkshire, England) by the name of Bernie Howgate. He explained that he was engaged in a Newfoundland tradition (though one suspects that it’s a Bernie Howgate tradition) – that is, going door to door selling your literary wares. In Owen Sound for a wedding, Bernie was making the rounds of Meaford homes before heading to Collingwood to promote his latest travel memoir. 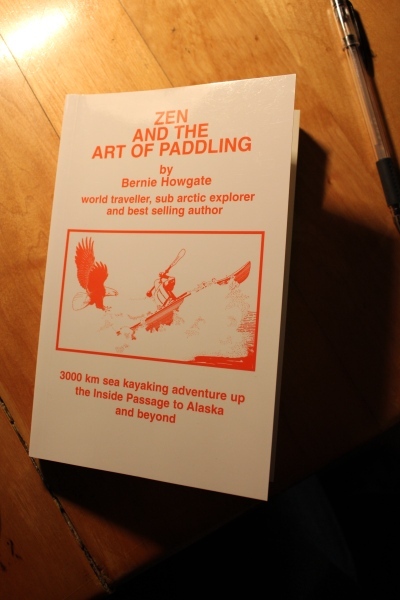 “Zen and the Art of Paddling”, is the sixth in a oeuvre that includes “Tales of a Travelling Man”, “Newfie or Bust”, “Around the Rock in a Bad Mood”, “Journey Through Labrador” and “Lazy Days in Summer”. 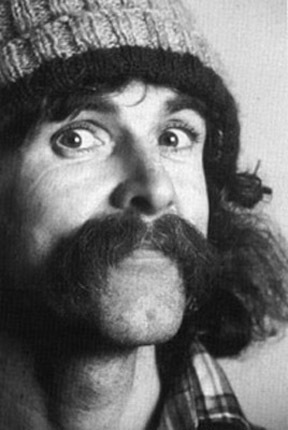 Since the early 80s, Bernie’s been financing his solo long-distance cycling and paddling odysseys by writing book-length accounts of his journey and selling them primarily door to door. This latest book covers the 3,000 kilometre sea kayaking journey Bernie took north through B.C.’s Inside Passage to Alaska in 2008 – and with my inscribed copy in hand, I’m ready to settle down for an interesting read. There comes a blow from nowhere, and it goes off like a bomb! Across the Bay to the east, Gordon Lightfoot’s “Christian Island (Georgian Bay)” paints a sunnier picture of our waters. When Kevin Moyse, an Owen Sound songwriter, read tales of Georgian Bay shipwrecks written by Scott Cameron (Meaford resident and former principal of our high school) – he was inspired to create an entire album and DVD package called “Songs of Georgian Bay”. Visit here to learn more. “Georgian Bay Sunsets” by Evan Paul (among other songs inspired by the Bay). Hear the CBC podcast. Paul Motian’s “Georgian Bay”, featuring Keith Jarrett. Listen to a sample here. And now for some shameless self-promotion. Back in 1994, the communities ringing the Bay from Owen Sound to Midland held the Georgian Bay ’94 Marine Heritage Festival, which featured numerous events and visits by tall ships to many of the ports, including Meaford. Organizers held a song contest, calling for songs that celebrated marine heritage, and your faithful blogger got to work on a lyric – “The Dance of Georgian Bay” – asking Sean Keating and Maureen Keating to join in to write the music and perform the song. Rolling like thunder from over the sea. As long as she’s here then our dreams will live on. As long as she’s here, then our dreams will live on. Spent a bit of this past weekend out on the waters of Georgian Bay, or to be more accurate, Nottawasaga Bay, which is our sourthern section of Georgian Bay. It began on Friday, with a trip up to the top of the mast of the Wandering Wind, Jeff Smith’s 33-foot boat, to affix some “thingmajiggys”. 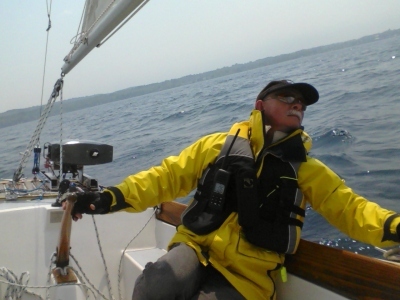 “Captain” Smith, eager to sail each spring, forgoes the traditional custom of removing the mast for storage in the winter, which many sailors adhere to but which necessitates raising it again in spring. 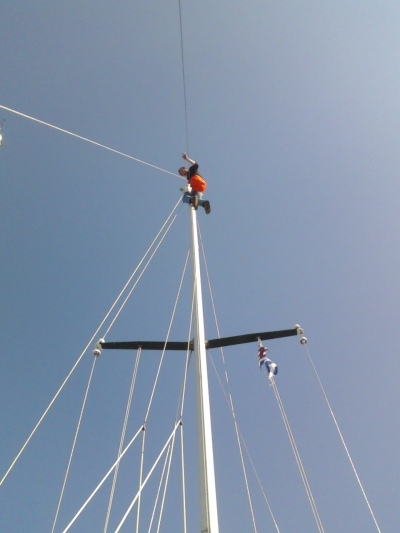 With a few screwdrivers and the instruments in a cloth shopping bag dangling precariously at my side, I ascended the mast, then carefully pulled out the instruments, fumbled for the correct screwdriver and carefully screwed in the various set screws and such. All while being extremely careful not to drop one of the screwdrivers or, heaven forbid, the instruments to the deck 50 feet below. Meaford Haven blogger in the "crow's nest". Job done, we headed out onto the calm (windless) waters of Georgian Bay for a shakedown of the engines, then drifted for awhile in the suprisingly warm air as the sun set. Late the next morning, after the rumble of the ferocious thunderstorms that had raged for three hours finally receded, I cycled down to Meaford’s Reef Boat Club to meet another friend, Barry Altman, who had ill-advisedly invited me to crew for him in the Club’s first sailing race of the weekend. I explained that I’d forgotten half of what I’d managed to learn about sailing, I’d never raced before, and my injured finger was not quite up to full ability. Brave man that he is, he didn’t withdraw the invitation. Now, Barry’s boat is a smaller affair than Jeff’s. Low to the water and short on amenities, the sleek MaryAnn was the smallest, though not the shortest, boat in the race. (“She’s a Bluenose One design class,” says Barry. “24-feet long and 2000 pounds displacement. She was designed by William Roue in 1945. 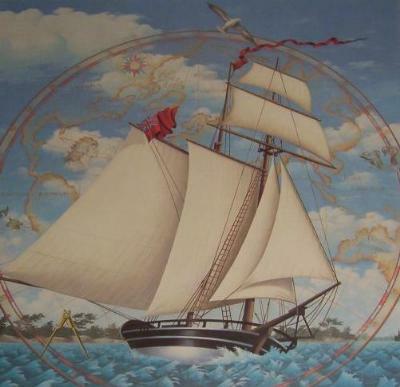 He was the designer of the famous Bluenose schooner that is on the back of the Canadian dime. The original boats were made of wood and many of them are still racing near Halifax and Chester, Nova Scotia. MaryAnn was first off the start line, so for a brief period we were in first place. A group of four boats had pulled ahead by the first marker, but we were around it and chasing them soon after. But as we rounded the second marker with a group of three other boats, the wind suddenly died. 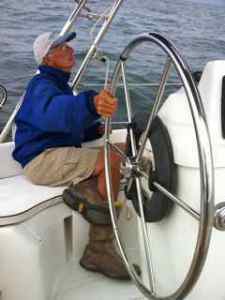 We were in a parking lot, as Barry put it, watching as the sails of the four lead boats, still leaning, riding the wind that had left us behind, got smaller and smaller. It was another 10 or 15 minutes before the first stirrings of a breeze had us on our way again. Sailing races are handicapped based on the size of the boat and the history of different models in races everywhere, and while the Mary Ann rounded the final marker in seventh place, our final position was 5th out of 11 boats. Three cheers!